You’re over weight, feeling tired, sluggish, bloated, and generally miserable. So you make the decision to lose the excess pounds you’ve gained over the past few years. And that’s great! There’s absolutely no reason to carry more weight than you should. Now you’re ready to start, but do you have a plan? Not just any plan, but a daily meal plan that will take you through each day, or week, without having to guess at what you’re going to eat on any given day. Creating a meal plan can be confusing and intimidating. For one thing, everybody has an opinion on the best way to lose weight. Do a search on the Internet and you’ll spend the next week checking them out. But you don’t need to complicate this process. First of all, the one universal truth in order to lose weight is to consume less calories than you burn each day. So, you need to know how many calories you should consume each day to lose weight. This is based on age, gender, height, weight, level of activity. This calculator can help you determine who many calories you should take in on a daily basis and on a per meal basis. What you’ll discover is the less physical activity, the fewer calories you need to consume to lose weight. For example, if you’re a 65 year old woman, 5’4”, 160 lbs., want to lose 1.5 lbs. per week, activity level consists of going from the couch to the kitchen, then the lowest number of calories you should consume is 1200. Take the same example with a moderate activity level (workout 3-5 days per week), then the number of calories you’re allowed is a little more than 1300 per day. Now, you’re confused. Well, don’t be. Simply put, your body needs fuel to operate. If you don’t give it enough fuel, your metabolism will slow down, you’ll experience muscle loss, fatigue, and soreness, among other things. Your body needs enough calories to sustain your level of activity. To be on the safe side, start with a small calorie deficit until your weight loss slows down or stops, also known as reaching a plateau. Then you can reduce your calories in small increments or you can increase your physical activity. There are others such as Coach Calorie which takes a slightly different approach when first starting. You just need to search for them. Of course, there are other factors to consider such as overall health, but this will get you started. And be sure to consult with a healthcare professional before you embark on any weight loss regimen. Now let’s move on to what foods to eat to meet your caloric goals. Now that you know how many calories you can consume each day, you need to know the percentage of protein, carbohydrates, and fats that are required. The calculator I mentioned above will give you the breakdown, so you don’t have to break out your calculator or break out into a sweat. You can, however, make adjustments to meet your needs. You may want to cut back on fat but increase the protein. 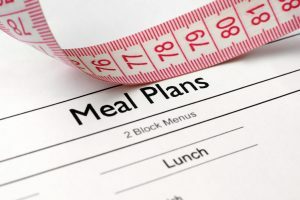 A good weight loss meal plan makes it easier to lose weight while maintaining good health and not constantly feeling hungry or tired; that’s the challenge. You can consume as many or as few meals per day as you like. Some people like to eat three meals per day plus snacks. Some people consume a light lunch and a huge dinner. The timing of your meals doesn’t matter for weight loss, although it should be consistent. If you have a day job, then your eating schedule is set for at least 5 days a week. If not, then experiment until you find something that works for you. A good meal plan would contain lots of vegetables, lots of lean meat (if you’re not vegetarian), and perhaps fruit, pulses and a sparring amount of whole grains and nuts. You plan your meals in advance, shop for the foods you need, then you get started. You won’t have to give it another thought until you lose your desired weight. Also, if you follow your meal plan and don’t deviate, you’re sure to lose those excess pounds in a healthy way. That means you’re more likely to keep the weight off. There is one more thing you should consider if you’re not already doing it; you need to move! If you do some form of physical activity already, then consider stepping it up just a bit to facilitate your weight loss efforts. If you don’t do anything, then you should consider something light such as a short walk in the beginning to kickstart your weight loss. You don’t need to do anything drastic, but you should do something to keep active. So, between feeding your body in a healthy way and moving your body in a healthy way, you’ll actually be living your life in a healthy way. And that’s what this is all about.